VANTIQ has “leap-frogged” or jumped ahead of all current players in the market with about a 2½ year head start. The market VANTIQ targets is event-driven and real-time application development and deployment for businesses. The major advantages VANTIQ has are around system architecture – which is very difficult for competitors to copy. VANTIQ benefitted by starting with a “clean slate” in 2014. Prior to that, industry thinking was primarily around: (a) request-response type systems as opposed to event-driven, (b) server based logic (3-tier using cloud) as opposed to software wherever it makes sense, (c) automation only as opposed to keeping humans intimately involved, (d) applications running only in the cloud rather than at the edge of a network. After more than two years of development, VANTIQ’s real-time, event-driven application platform became available in January 2017 and continues to progress rapidly. 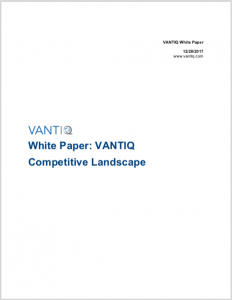 For more analysis of the competitive landscape, download the VANTIQ Competitive Landscape Whitepaper.